Yes, you can build an economic model without computers. In fact, around 1950 New Zealander Bill Phillips did, modelling economic flows not with electrons, but with water. He built a total of 14 of these “MONIACs”, one of which has been restored by Allan McRobie and can be seen in operation in this video. McRobie is a hydraulic engineer, not an economist; Phillips at first was neither, nor was he a plumber, but rather a journeyman electrician and polymath (eventually an economist at the London School of Economics). McRobie describes the machine’s operation in some detail. Like many economic models it fails to consider the role of land, but it does have a bucket representing optimism (perhaps Keynes’ “animal spirits”). 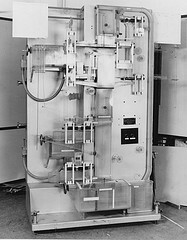 Phillips’ original design had an additional feature, a high-voltage connection that could be used to execute meddling politicians or bankers (see the video from about 17 to 19 minutes), but that has been removed in the restoration. Like Henry George, Phillips smoked and died young, in 1975 . Of course, a much earlier model of the circular flow of economic activity was Francois Quesnay’s Tableau Economique, which did explicitly address the role of land. Incidentally, it is clear from Keynes’s tone in a number of passages that he views landowners as parasites, so I find it odd that he never seems to have advocated land-value taxation, or even to have commented on it.